This was originally intended as a one-off piece, but, on finishing it, I’m thinking that it might just be one panel of something bigger (something bigger I haven’t done yet). This is another example of reasoning about miscarriage – early miscarriage in particular. Again, it might help some people to think of it in a purely biological way. For many people, though, it’s much more emotional and involves the broader legacy of what has happened rather than the physiology alone. It’s about what the cluster of cells represents. I drew the cells diagrammatically, as you might see under a microscope, to represent the cold biological facts. The photos in the DNA strand are of my grandmothers, and I hope these add an element of humanness to a statement which is very pragmatic. I’m not sure it works on anyone other than me though. Feel free to let me know, but, as I mentioned, it might be the start of something more in-depth. Not sure if a ‘speaking arm’ works or not (rh speech bubble). What can I say? It was all very ‘bodily’ and vocally unexpressed at the time. Not that my arm has ever had the ability to speak other than what comes out of the end of it onto a page in the hope of communicating something. Also – having trouble with colours. This is meant to appear as warm browns and browny-pinks. I’m hoping to get a better monitor more geared to truer colour generation. Last time I was producing digital work, many moons ago, I was using an iMac, but have since ‘gone over to the other side’! 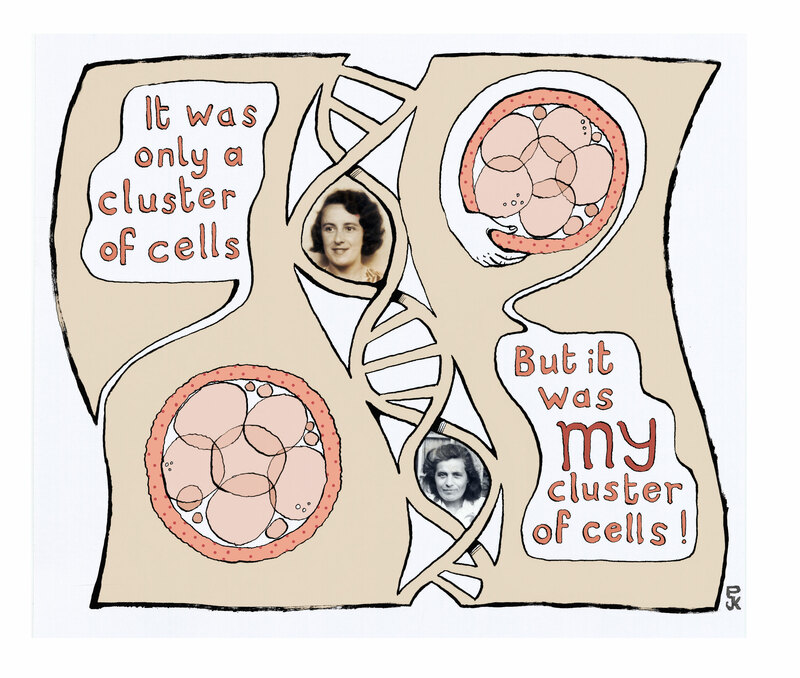 This entry was posted in comics, graphic medicine and tagged comics, comics and medicine, comics panels, DNA, double helix, early pregnancy, family, genetic counselling, Graphic Medicine, human pregnancy cells, miscarriage, pregnancy loss by Paula Knight. Bookmark the permalink. Paula, that fact that you can express yourself this way is really wonderful and incredibly brave. Having lost two pregnancies myself, it’s hard to feel like people can truly understand the magnitude of the grief you feel, and worse, don’t want to talk about it. What’s unseen doesn’t quite hold the power of what was seen. They don’t even have a name for someone whose gone throught this loss. There are widows and orphans, but nothing to describe a mother who’s lost her child (born or unborn). I’ve been widowed and I’ve lost pregnancies. I can tell you the latter is harder to get through. So keep going. Thanks Susan. That’s curious about names. A one-worder might make it easier to describe the situation. However, my overall feeling now is that I don’t want to be defined at all by whether or not I have a child, unless perhaps I’m choosing to talk about it, in which case a word akin to ‘widow’ might come in handy to save convoluted and emotional explanations. True. Defining ourselves by labels tends to box us in. However, for dealing with the outside world, it would simplify matters quite a bit. I do wish there were something for couples who have lost pregnancies that would help people see them as parents who have lost a child. Which in my mind, they are. I certainly think it’s something that anyone who has gone through sub/infertility/miscarriages is going to understand and relate to and that’s your target audience. Over the four years of trying to get pregnant I even thought about my egg each month that wasn’t getting fertilised, etc…even felt bonded with the potential of it becoming a baby…so to have that “cluster of cells” would be even more emotional. And labels are so difficult! I try not to say I’m a widow, but I was widowed, because it’s more something that happened to me – I had no control versus who I am…I’m the verb, not the noun…but it’s also handy as you say because you can just say it and that’s that. Thanks for reply Sasha. Labels are difficult because they can be too defining and too narrowing. We’re so much more than the things that have happened to us, although they shape us in some ways. I like your ‘I’m the verb…’ I tried to describe the whole idea of loss/lost like that too! I find it kind of humbling that people can be so open about their own situations in response to something I’ve drawn. Will you be letting people know when your degree show is? I’d love to see it! I think it’s because they are the two people I look most like in my family, so it fitted with the idea of DNA and passing genes on. I guess that would only really be clear to people who know what I look like though. And I just really like those photos. Ta for comments! I wanted to drop you a note to say how moving your images are. I have a feature on my blog tomorrow about miscarriage and have added in this image (along with a link and credit to you). I’m going to be running a series of posts about miscarriage in the new year and wondered if it would be ok to use more of your images, please? You really seem to capture how it feels and I would love to be able to share that with others I know who have gone through it.